Bankera’s ICO is getting more and more traction every single day. After community feedback, we have decided to slightly modify our ICO structure. First, due to high interest, we will issue 10% of the whole token supply during the pre-ICO. We have also introduced a HARDCAP of 25M EUR for the pre-ICO. During the ICO we will issue 30% of the tokens. There are also going to be a soft-caps during ICO, so that the price of after each chunk of 1,000,000,000 BNK will increase by 0.001 EUR. If all 30% of the ICO tokens will not be sold, the remainder will be distributed pro-rata to the pre-ICO and ICO token holders. This means that 40% of the token supply will be shared among the participants of pre-ICO and ICO. The rest of the ICO 30% will be distributed during an SCO (secondary coin offering) in the future, but never at a price lower than 0.1 EUR per BNK. 25% of total amount of tokens will be attributed to the team as motivation as well as for a bounty program for outsiders. The team‘s tokens will be allocated over time. 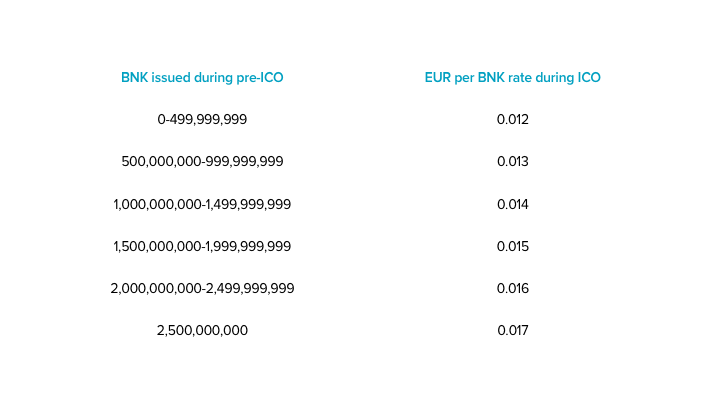 Hence, the total HARDCAP for pre-ICO and ICO is 10,000,000,000 BNK (2,500,000,000 + 7,500,000,000) worth 177M EUR (25M EUR + 152M EUR) and at least 750M EUR for the SCO. In case of HARDCAP being reached in pre-ICO and ICO, there will be 10bn (2.5bn + 7.5bn) tokens issued during pre-ICO and ICO with total contribution of pre-ICO and ICO of 177M EUR (25M EUR + 152M EUR). In case of the HARDCAP being reached in pre-ICO and ICO, there will be 10bn (2.5bn + 7.5bn) tokens issued during the pre-ICO and ICO with a total contribution from pre-ICO and ICO of 177M EUR (25M EUR + 152M EUR). In case of the HARDCAP being reached in the pre-ICO and the ICO only issuing half of its tokens, there will be 6.25bn (2.5bn +3.75bn) tokens sold during pre-ICO and ICO with a total contribution from the pre-ICO and ICO of 94M EUR. 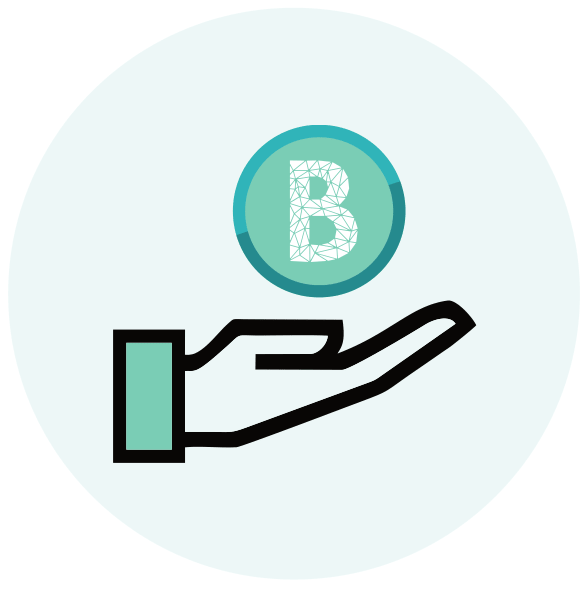 The remaining 3.75bn BNK tokens will be distributed pro-rata to participants of the pre-ICO and ICO: for each BNK they will get an extra 0.6BNK. So the total amount of tokens issued during pre-ICO and ICO will be 10bn BNK. In case of the HARDCAP not being reached in pre-ICO and only 1.25bn tokens issued during pre-ICO while the HARDCAP is reached for ICO, there will be 5bn (1.25bn + 3.75bn) tokens issued during the pre-ICO and ICO with a total contribution from the pre-ICO and ICO of 70.25M EUR (12.5M EUR + 57.75M EUR). In case of the HARDCAP not being reached in pre-ICO and only 1.25bn tokens issued during the pre-ICO with the HARDCAP also not reached in the ICO and only 1.875bn tokens issued during the ICO, there will be 3.125bn (1.25bn + 1.875bn) tokens issued during the pre-ICO and ICO with a total contribution from the pre-ICO and ICO of 39.625M EUR (12.5M EUR + 27.125M EUR.) The remaining 1.875bn BNK tokens will be distributed pro-rata to participants of the pre-ICO and ICO: for each BNK they will get an extra 0.6BNK. So the total amount of tokens issued during the pre-ICO and ICO will be 5bn BNK.